Is your fireplace boring? Add some life to it with fireplace screens! Fireplaces serve a variety of purpose in one’s home. During the cold season, the fireplace can be a very functional portion of the home where family and friends can gather around. However during the warmer months, despite being there for aesthetic reasons only, the fireplace still brings the cozy feel to the home. In the same light, a fireplace screen serves a dual purpose as well–it is both functional and has aesthetic value in itself. Fireplace screens make sure that staying in front of a fireplace during a cold night need not be a messy and dangerous endeavor. In this list that I will share are 20 fireplace screens that make your night with the family a safe and pretty one. Take a look at these photos that we have prepared for you. This fireplace screen sure has a lot of butterflies in it. With the golden color of this piece along with the 3D effect of the butterflies emerges a metamorphosis of nature that sure is elegant albeit being eclectic. A love for geometry may just do the trick here. If you are into fireplace screens and equilateral triangles, this screen is really pleasing to the eye. Not to mention the lovely silver champagne color it comes in! It’s sleek and it’s simple. Minimalist, yes, but you can never go wrong with this Alton II Pewter screen especially in a silver-themed space. The simplicity in its design brings out the real elegance of this piece. The beauty of this fireplace screen comes from its appearance and its adjustment features. This folding screen make adjusting to the size of your fireplace easy breezy. Plus, imagine with all the flames behind it, the effect is sure sublime. The geometry in this piece is simple but exquisite. These lines give off a classic effect to the fireplace screen especially that it is in silver. And with the orange and yellow lights from the flames behind it, the result is surely spectacular. The obsessive-compulsive spirit that lives inside you may perk up when you see this fireplace screen but I believe that despite the differences in the sizes of the triangles, it remains pretty because it looks as if it is from a paper cut-out -and when we talk about fireplace screens, you don’t get to have that often. Small circle, small circle, big circle. This is quite a unique piece that you might prefer to be a bubble loop instead of a fireplace screen but it is a pretty piece to put inside your home–not unless if you have a family member with trypophobia! Folding screens make your life easier especially when you want to adjust to the size of your fireplace at home. This piece is elegant because of the thick, solid circles, and the possible effect of the flames on the silver mesh of the screen. This piece will look really good in old Roman and Grecian homes. Greek gods may even be proud of this fireplace screen especially with the elegance that the gold and white colors give off. Who said that plaid can only be worn? Drove my Chevy to the levy but the levy was dry! This plaid fireplace screen is very country but is also very traditional. This is a pretty yet simple fireplace screen you may even DIY. The interlink in this piece is simple but has been made more special by the golden buttons. 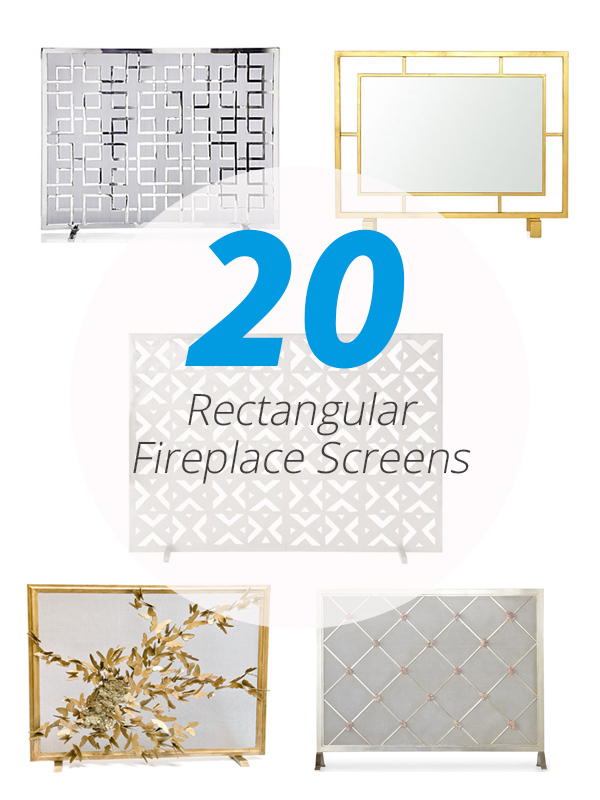 And yet again, folding screens make our fireplace experience more convenient! This fire screen reminds me of the Cretaceous and Jurassic era when scaly dinosaurs used to live. This piece is quaint with a very unique vibe due to the unusual shapes in it emphasized by the color of the screen. This fire screen also reminds me of the Croods and the Flintstones, don’t you think? This piece is simple and I’m not so sure how this might blend well at home but the eccentric accents in between the interlink give a certain earthy character to this fireplace screen. Both the name and the look of this fireplace screen are fierce. This piece comes off with a strong character that reminds me of something both Vikings and Valyrians will use. This fire screen has a certain sci-fi effect. The geometry is neat and the color is sleek. Plus the design is very cool and unique. This is something you may want to consider making a DIY version but the antiqued brass in this fireplace screen provide a certain effect that may go well if you are considering an antique themed living room. A piece that can go nice with the nice pieces of furniture you get from bargain sales and flea markets. A fireplace during the Christmas season will go well with the Silver Star Panel fire screen and you can complete it with your Yuletide stockings and eggnog perhaps? Although you may want to put out the fire and put this aside to make sure Santa can make his way out. You can never go wrong with this golden fire screen. It’s definitely useful but definitely pleasing to the eyes as well! Somehow it reminds me of Athenian accessories so elegant the god’s approve. A classic piece with a name that goes well with its exquisite look. The design reminds me of something royal and the craftsmanship shows strength of the piece’s character. The Fleur-de-lis in this piece does not overpower the swirls but instead they complement each other in a very beautiful way. This metal piece give off a classy and regal vibe that kings and queens might do welcome this fireplace screen in their castles. Fireplace screens need not just be a functional thing in your homes but also a pretty piece that will complement your entire theme at home. And at the end of the day, we should not compromise both our family’s safety as well as our love for aesthetics and style. Well, there are so many designs for a fireplace screen and for sure, we will be able to choose the ones that would be perfect for our home!